Why doesn't this forum post have like a million pages and 10 million likes because this realy deserves it. Finally no more renaming bin folders. You may see a surge in posts since inthelittlewood uploaded a video on it today. Can you please make it for mac?! quick fix. switch to pc. lol i doubt there will be a mac version because this uses batch and exe files. and lets be honest. apple has really screwed up xcode bad with the latest versions. Thank you very much for this, it's very handy! Wow this is really cool NICE JOB! I've run the verifier and all my products are fine but I still get an error when I try to run this. Fixed the problem, it was a folder structure on my end. Phenomenal mod man, very useful. Great job. I feel obligated to say this, because this rocks. This is something else. This is fantastic. This would make it so much easier for me to check out modpacks and uninstall them. Thank you. Thank you. Thank you. Thank you ever so much. I have a question... Is this something that doesn't really need to be updated when the game is updated? ok, so i have a lot of different .minecraft folders for different mod setups in singleplayer, one of which is a 1.1 server, so will this allow me to switch between them without having to trade them over each time? Okay this is for people on windows who want to Add-in some extra ram. 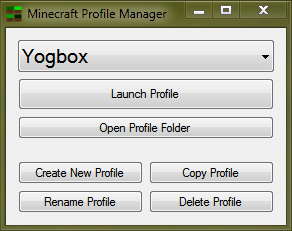 Simply create a text document in the minecraft profile folder and then open it. Javaw -Xmx2028m -Xms1024m -jar "C:\YOURINFO\Minecraft.exe"
then save the text document as Minecraft.bat and save type is all files*. Hi, I'd like to say one little thing, and that's that this really needs some form of update that will allow it to run on Windows XP. Because lemme tell you, it doesn't work. Period. I have already checked with the tool linked in the first post, I do have .NET 3.5 installed, yet it does not work at all. This needs to be fixed, otherwise you're not going to have a lot of supporters.